This 175 RPM,1.5 HP, dual capacitor model is a great carpet scrubbing floor machine. Use it with our carpet scrubbing bonnets listed below for the ultimate in cleaning performance. The solution tank that comes with the carpet scrubbing machine carries 4 gallons, and will dispense the solution you are using, as you are using the machine. No need to stop what you are doing, and go spray the next area to be scrubbed, the solution tank does it all for you. Great for use on low knap or thick burly carpets. The 1.5 HP motor, and triple planetary transmission will power this carpet scrubbing machine through any job. 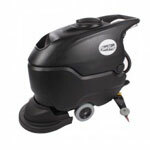 The motor spins at 175 RPMs to provide just enough cleaning action to get any job down right! For use only with bonnets or pads. Looking for a floor buffer scrubber in a different size? 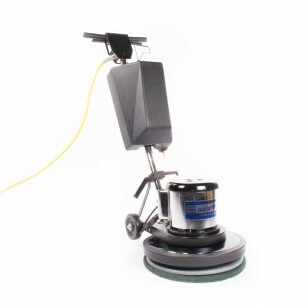 Take a look at our complete line of rotary automatic floor scrubbers for other great options, if this machine does not meet your needs.